This nice Samurai Sword set has 3 different pieces in the 3 different length Japanese Samurai Swords . 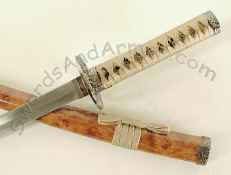 The long Katana sword is complimented with a mid-sized "Wakizashi" size and short Tanto. They all have carbon steel blades with an ornate hilt with nice silver and gold finish detail work. The sheath has a very nice durable wood grain finish. The trio of swords comes with a display stand as well. We thought the value was exceptional on this set and we believe you will too. This site showcases the swords and battle armaments of the great Japanese Samurai sword or oriental warriors. Our shields, Suits of Armor, and medieval helmets are also available at the lowest prices anywhere. We have vast international resources available. If you are inquiring from a military academy, we develop new items constantly. If you have a particular sword in mind, e-mail us a JPEG or GIF file and we will see if we can match it. The Suits of Armor are all hand-made. They are shipped disassembled. The Medieval helmets are shipped in a protective gel for ocean transit. Shields are available in plain steel or with an antique painted finish. All shields can also display one or two Swords and can be mounted on the back using supplied hardware. Hangers and displays are available so you can properly display your Medieval treasure. The Swords are not sharpened although they will take an edge. All halberds and polearms are shipped in two pieces that screw together tightly. All merchandise is manufactured in our partner factories in Spain and India. Our offerings change and are expanded daily. Check with us for new items. We want your business and will work hard to earn your trust. The best cleaner / preservative that we have found is good old WD-40. (TM) If only the Samurai knew of the wonder and power of this magic potion, he might not have spent so much time polishing his sword. Shipping: We ship all merchandise via UPS for all domestic orders within the continental United States. For international orders we ship via Parcel Post Air Mail. We have these to be the best combination of low cost and reliability. Due to size limitation some sword items or other larger pieces may not ship internationally. Most all of the katanas can ship be shipped internationally. If you would like a freight quote, email us and we will give you and accurate estimate. Make sure to include the item that you are interested in along with your city, state and local postal code if any. We will work hard to gain your trust and earn your business. You will find our pieces to be of the highest quality and best value. Give us a try. You will be satisfied with your purchase. We hope you will give us the opportunity to serve you with your next edged weapon purchase. You are responsible for compliance with all local laws.